Ok - we have 4 days until "Do A Liz Thing Day", if this is the first you've heard about this, check out my previous post. And, as mentioned I wanted to share some fun ways to share kindness. 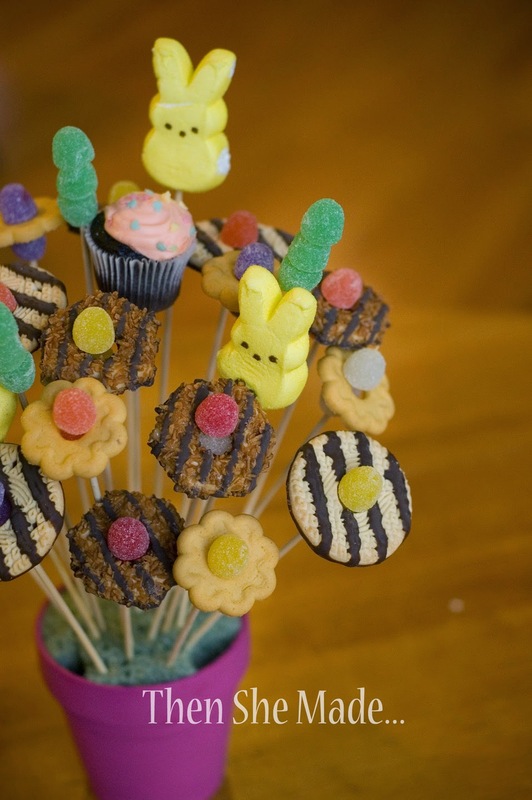 One of which is the Cookie bouquet. 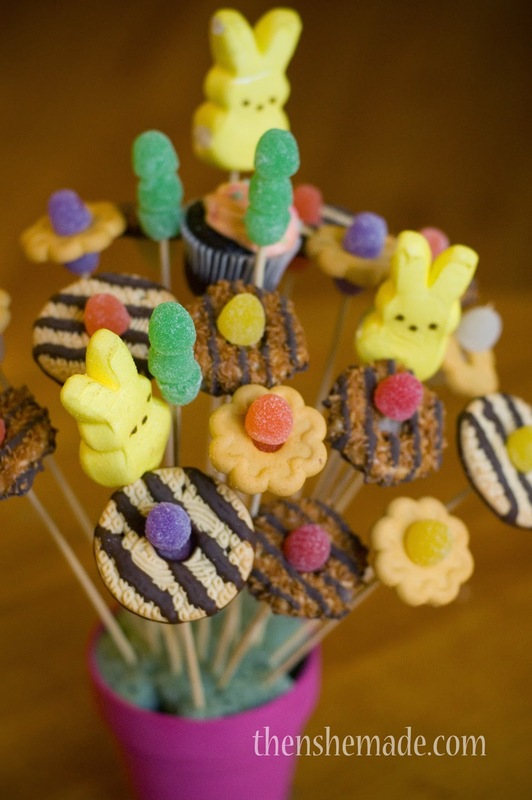 Cookie Bouquets are not a new thing. I first posted about them back in September of 2010, it was one of my first few posts on this here blog, but I still love them and love to make them. They are a crafters triple threat. They are easy to make, they are cute, and they make people smile! First gather your supplies - the cool thing about these flowers is that you can buy the cookies and treats all pre-made and because of the quantity of cookies in each package, you can make 4- 6 bouquets. So, they are pretty economical to make. I purchased the two kinds above plus Keebler Fudge Stripes (not shown above) Pretty much you just want cookies that are pretty thick so they don't break easy and they need to have a hole in the center. 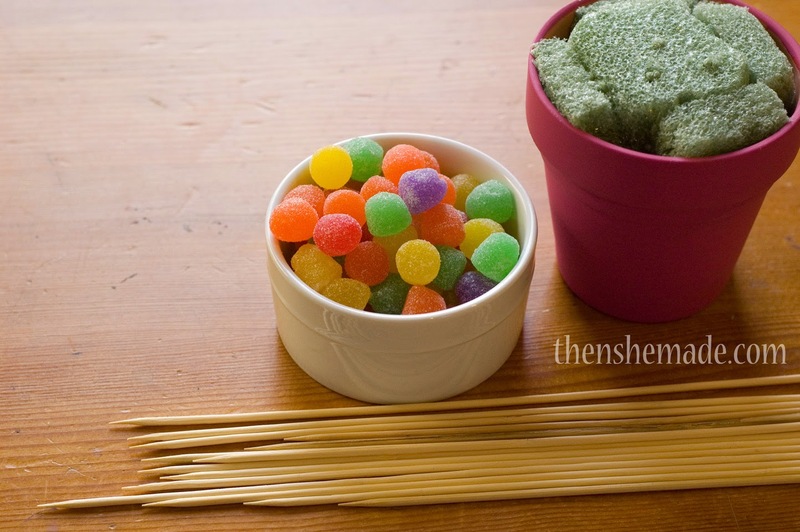 You also need Gumdrops, food skewers sticks, a flower pot and flower foam. Also, not shown, but you will want to have some floral moss and ribbon on hand to add the finishing touches. Step 1: Prepare your sticks. Keep one long and then cut several others down to various, shorter, lengths. I did the following: 1- long and then 5 to 6 of each of the other sizes. You want them in different lengths because you start in the middle - the middle being the highest point, and then build down from there. The center is high, the edges are low. Step 2: Gumdrops are your friends! 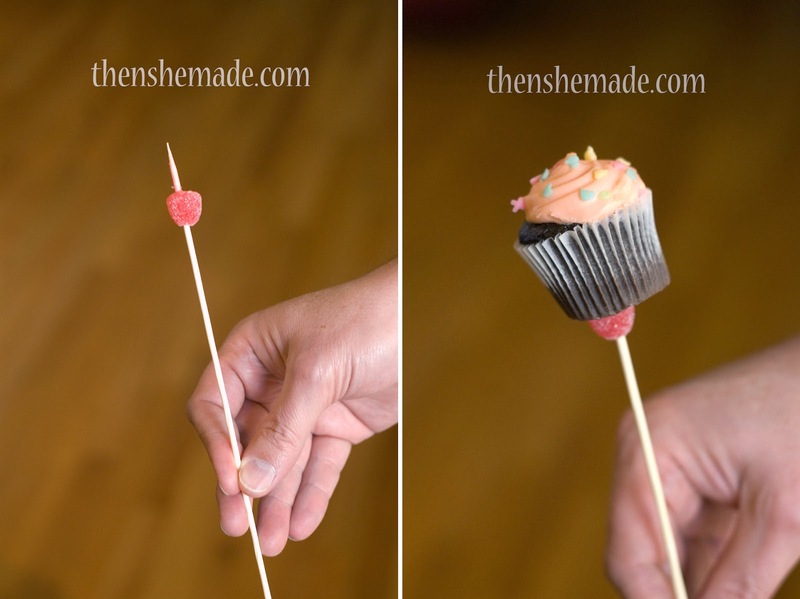 Take a gumdrop and push it a little ways down on the pointy end of your LONGEST skewer. Then add your treat. I started with cupcake for my center. 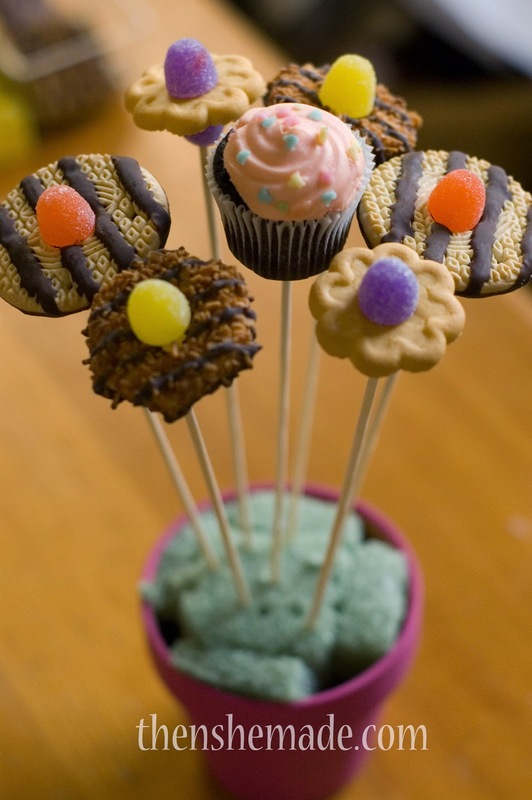 The gumdrops act as a stopper for the cookie or cupcake to rest on. 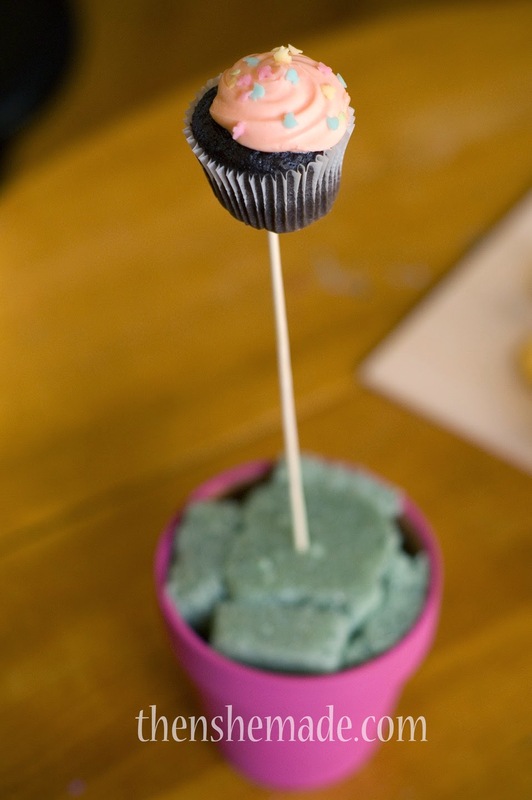 Step 3: Place the cupcake in the center of your pot, make sure the floral foam is sturdy and holds it in place well. 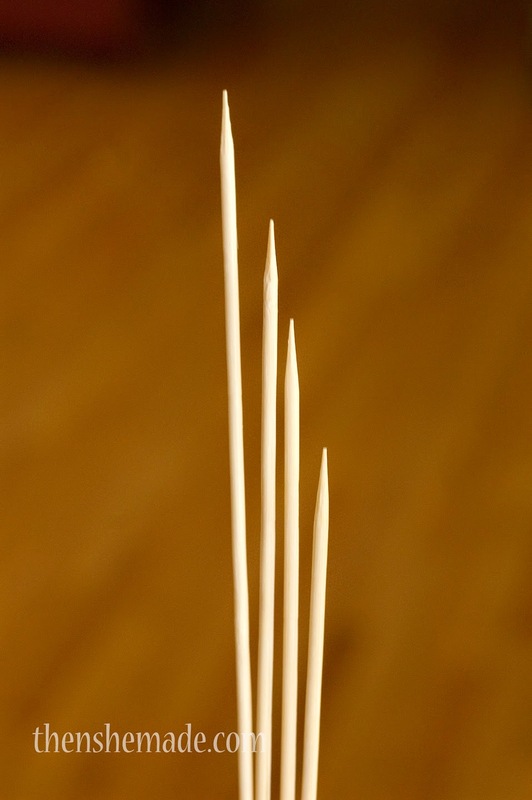 Step 4: Once your center treat is in place, take your next longest set of skewers and start making flowers. 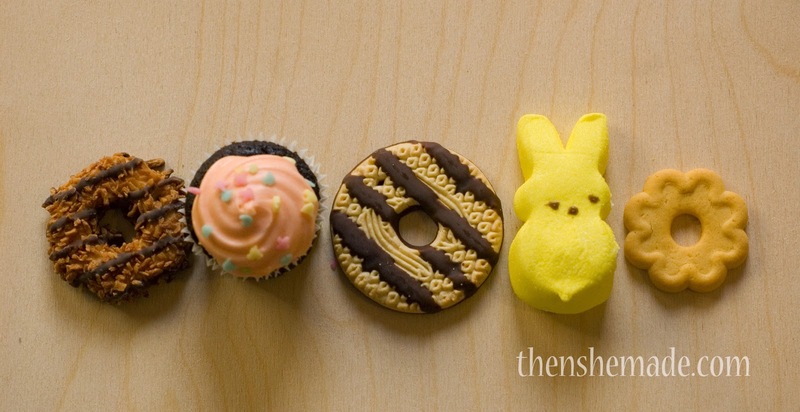 Again, you will put a gumdrop on the stick first, then the cookie. To finish it off, add another gumdrop to the top of the stick to cover the point. This holds the cookie in place and also acts as the center of the flower. Also, add in anything else you'd like - I added in the Peep bunnies and also made some green stems by just stacking green gumdrops. Step 6: Carefully tuck in some floral moss to cover the floral foam and add a cute bow around the pot. Word to the wise, make sure you actually have floral moss before you start making your bouquet - I did not. So while my bouquet is still cute, I can't actually finish it or give it away yet! Oops! And finally, your last step. GIVE IT A WAY! I know, I know, it's not healthy but I promise whoever you give it to will love it! Quick Tip! I like adding in the cupcakes, however, every time I've added them before it has been winter. Which means cooler weather. Today, the temps where in the 70's and guess what? Cupcake frosting melts. 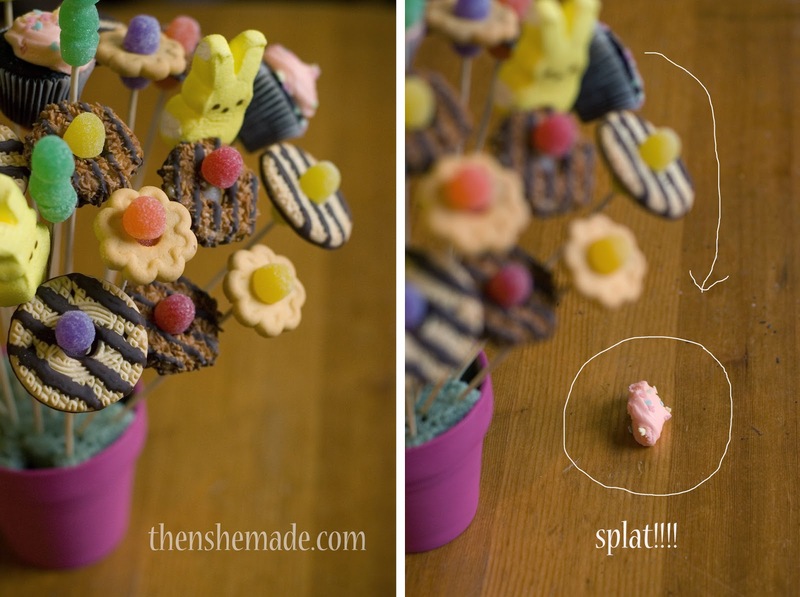 I was taking photos - you can see the before on the left and all the sudden - Splat!!! - the frosting slid right off. So, depending on your location, and the temps, you may want to just stick with the cookies. If you plan to make one of these and give it away for Do A Liz Thing day. Remember you can print tags from my previous post: A Quest For Kindness.